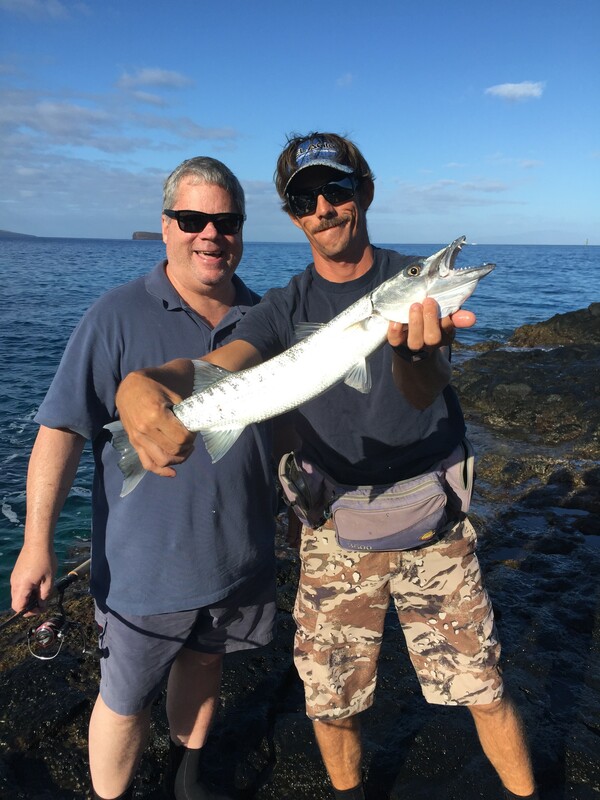 Shore fishing on the south side of Maui with a subsurface bait, this small barracuda put up a pretty nice fight on a light tackle pole. The teeth on these barracuda are extremely sharp. All 3 sets of them! They have scissor like teeth in the back and just in front of that they have some needle like daggers and in the front they have huge triangular shape dagger teeth. So often if you’re fishing with mono they will bite through the line. Sometimes you get lucky, like this angler, who did a great job getting this one to shore without his teeth biting through the line. The angler’s husband actually booked the trip with the hope to catch a bone fish because he has targeted them before in other locations but has never caught one. 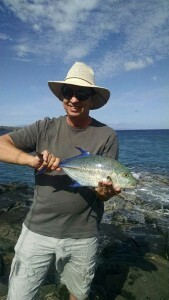 So he thought he would give it a try shore fishing in Maui. At the beginning of the trip my client said “my wife always out fishes me she has a lot of experience”. So anyone that knows about bone fish is that they’re not easy to catch. The conditions could not have been any better. We were actively fishing for about an hour when we got a double strike. I knew they both had fish on and that her’s was bigger because it was smoking line off the reel and it was difficult to keep the rod up. So immediately I asked her husband if he was ok and he said yes go help her. He got a trumpet fish and it came in quick. So the fish ended up running down the shoreline and in toward the beach. Then ran all the way up the beach straight toward us. We got a really good look at what we had on the end of the string. And then the thing took off another eighty yards straight out and a hard left back toward the beach. As the fish was coming in toward us again the angler was getting tired but the fish was too and I knew it was pretty much done fighting. Once we grabbed the fish and pulled it out of the water we could tell how big it was; a 10lb. bone fish very round and thick with beautiful color. That was a fish fight of a lifetime! We were patient when we arrived. And from the moment we started fishing we were persistent in switching up the baits, techniques and the spots at this location. We persevered through the weather that started rolling in which was consistent showers that lasted pretty much the entire morning. But we were ready for it with Jackets so everyone was comfortable and neoprene shoes so our feet were warm. 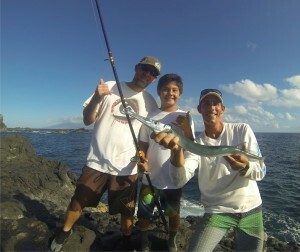 After a few hours fishing on the rocks all 3 of us were close to each other fishing with light tackle. We had a bigger rod next to us soaking some fresh dead bait. It starting going off! Screaming line off the reel with authority. I quickly ran over to the rod, tightening the drag making sure the fish was still on. I could tell that it had some serious weight to it. I got the rod into the anglers hand and it was difficult to hold the rod up. The fish was pulling so hard. After a few long minutes. The fish started to come in towards the rocks. As it was approaching it starting going under the ledge of the rocks we were standing on. Almost breaking us off we managed to pull it out from under neath with our 10’6″ rod. 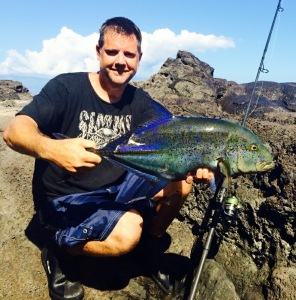 When the fish was done fighting the big challenge was to get it up on to the rocks. That took twice as long as the fight. There was a good 3-4′ surge of white water on the rocks so we really had to time landing this fish. What an amazing catch! This is such a pretty fish. The word kagami in Japanese means mirror. That’s why they call it a kagami ulua. The skin is like a mirror – shinny, flashy, and iridescent. 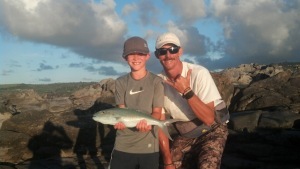 The thread fin trevally is a very prized fish to catch. 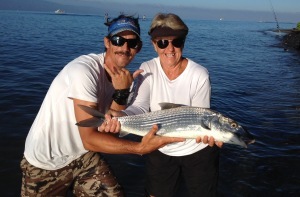 Just goes to show anything can happen when you’re fishing from shore in Maui. 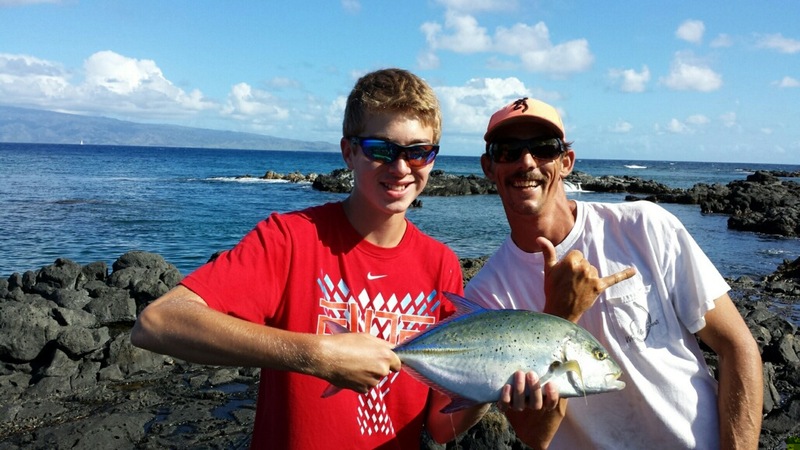 Lucky this angler’s dad wanted to take him fishing from shore in Maui. Stoked this angler had the stamina to cast and retrieve for 3+ hours until he was rewarded with this highly prized catch in the last 10 minutes of fishing. After catching a handful of smaller fish; small blue fin trevally, small trumpet fish, the bite kind of got slow for a bit. But we kept trying and trying, being persistent. The angler was casting really well and got the flex of the rod wired and was able to cast further and further throughout the day. With only a few minutes left of fishing he ended up hooking into a really nice fish. 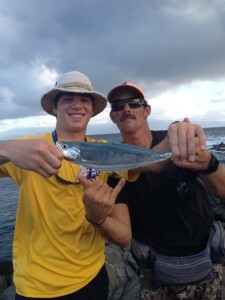 It sure hit the bait like a blue fin trevally with a hard fast run and immediately we knew we had a good size fish on. He did a great job pulling it in. When the fish got close to the rocks where we were standing it swam under the ledge for a moment and we thought it was going to come off. I still couldn’t tell exactly what kind of fish we had on. Certainly not expecting it to be what it was. As soon as the fish came out of the undercut it was close and we could see that it was a gray snapper which are very difficult and rare to catch from shore. There were two other anglers on the rocks near where we were fishing. They could see the fight and hear the reel going. They were watching us reel the fish in and as soon as we landed it we held the fish up and they cheered and yelled at us “uku! sashimi!”. It’s a special fish to catch from shore, highly prized, and great to eat. Another awesome trip! You never know what an afternoon shore fishing tour will provide. 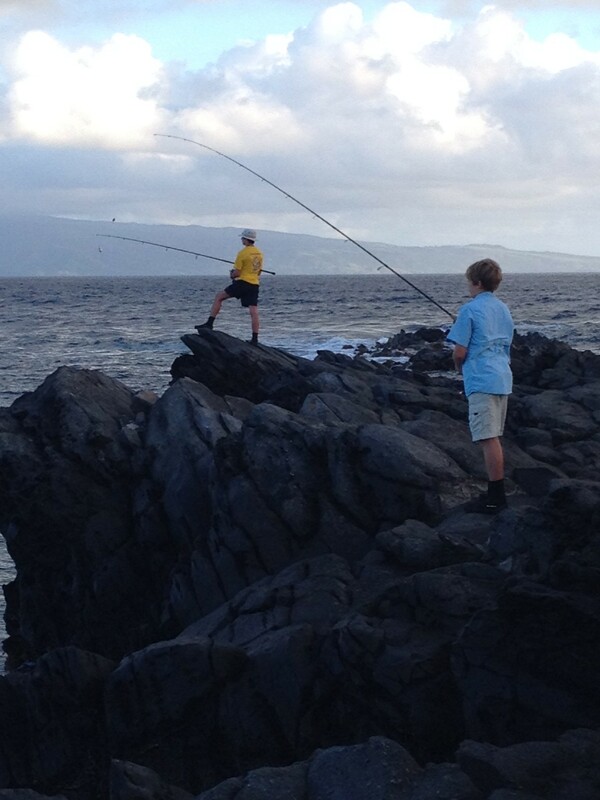 Just another beautiful Maui day – shore fishing off a remote cliff 25 feet above the water. 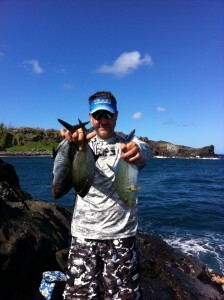 We were throwing live bait having some trigger fish kind of harass the bait. 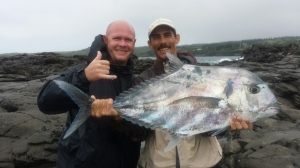 Then just as the angler Kent was saying “argh get away from my bait” to the trigger fish they immediately took off and a big blue fin trevally (omilu) came up and hit it! Instantly it peeled out about 75 yards of line with authority and then slowed down. The fish ran in toward shore and then a big hard run back out. It came back inside and toward the cliff. I went down to the water’s edge to retrieve the fish and make sure the line stayed away from the rocks. He went underneath twice and kind of got stuck. I thought we were going to lose it seeing the line rub along the coral. Surprisingly it stayed on and didn’t break for how heavy the fish was. I could hear Kent yelling from up above “watch out there is a barracuda heading right for you!” I couldn’t see him because my head was down. 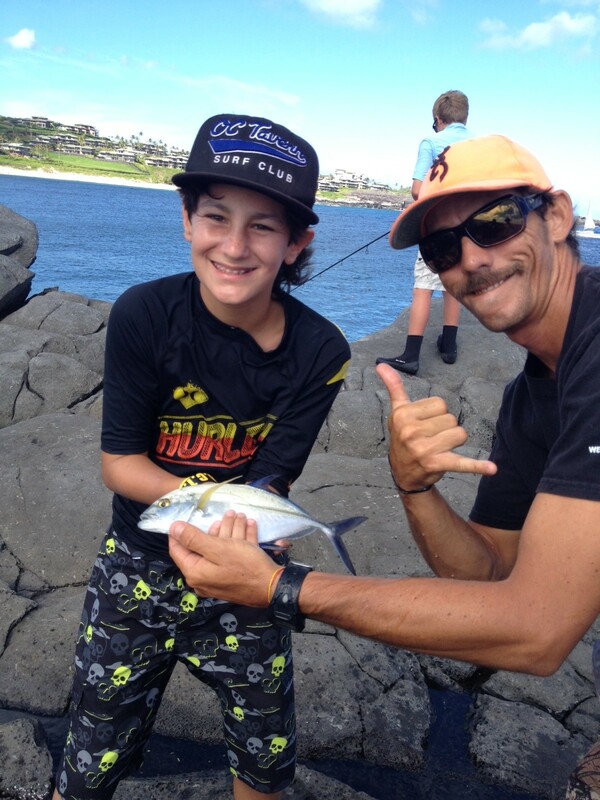 When I pulled the trevally in I noticed there were two fresh bite marks on the fish’s tail right next to where I reached down with my hand to pull it out of the water. And that is how close I came to having my hand chopped by a barracuda getting this fish out of the water. It was well worth it! Kent said the barracuda was twice as big as the one we saw earlier in the day which was 20-30lb. He said the one that was chasing the omilu could have bitten the one we saw in half. So it must have been about 40-50lbs. Kent fished with me last year and we caught three small blue fin trevally about 1-2 pounders. This 12lb. omilu was his redemption! Another fun day shore fishing in Maui! These guys had non-stop action. We ended up catching three blue fin trevally. This one was the biggest about 4 -5 lbs. The other ones were 2lbs. The location provided awesome views and was quiet, secluded and definitely off the beaten path. These guys were troopers and were willing to go the distance to get there. I never get tired of looking at these beautiful blue fin trevally. This day we saw plenty fishing from shore and ended up landing this nice 4 pounder. For how big this fish is, it put up an amazing fight. Almost busting us off on a rock ledge as it was coming in. You could see the fish digging to the ledge trying to get there to break us off. They usually swim in pairs or small schools. This one had 3 others next to it as it was fighting. But this angler sure never gave the fish a chance to get away. Any time he was able to retrieve any line he was on it. And you have to be to land these fish. For being new to shore fishing in Maui, these guys were quite the anglers. 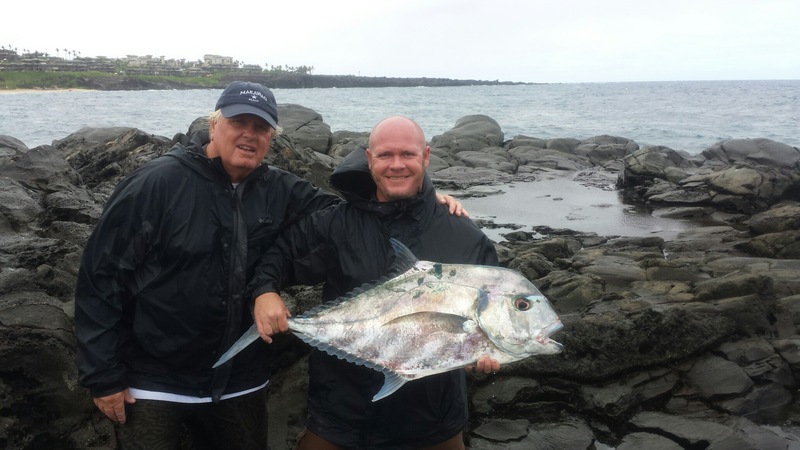 We scored this leatherback jack right when we got to the spot which set the tone for the rest of the tour. For how big this fish was it sure did hit hard. This angler was ready and set the hook like a pro. Then this 5lb. 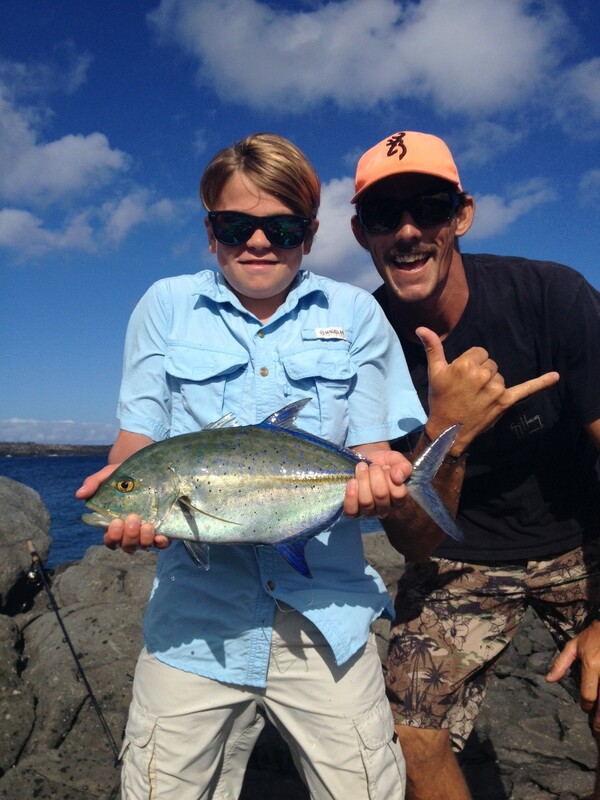 blue fin trevally sure gave a great fight all the way to the very end. It was trying to break us off on the coral ledge as it was coming in. But this angler did awesome keeping him out of the rocks. This angler was using the lightest pole we had and this thing sure did give a great fight on 8 lb test. He did a nice job bringing in this beautiful papio (small trevally). A day of action. We all had a good time – super fun for everyone! The trevally are really biting this year. Today was no exception. Within 20 minutes of arriving at our location we hooked into a 6-8lb. 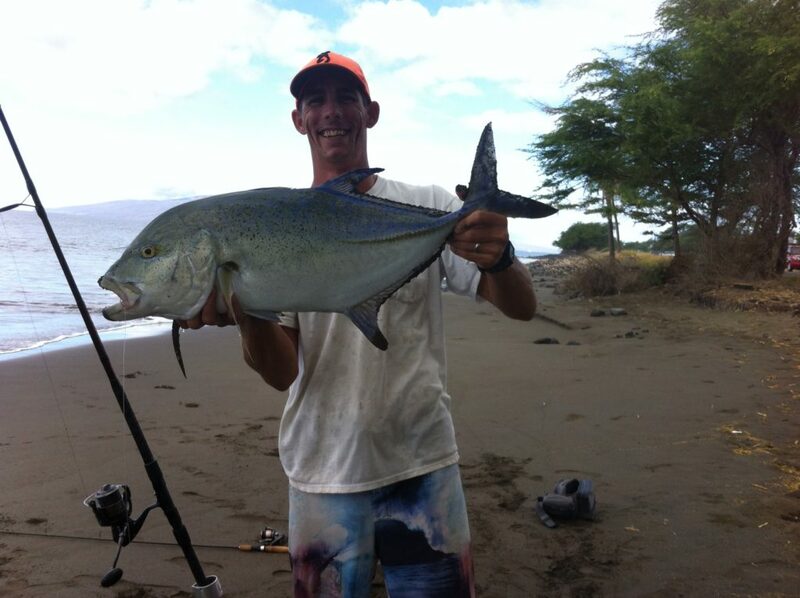 blue fin trevally. Had it on for a little bit and then it broke off. Shortly after we landed this nice 4lb. 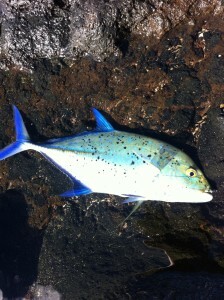 papio (small trevally) close to the rocks right in front of us. It was a great thing that this guest had a pair of Maui Jim sunglasses on so he could see the fish come up and strike the bait below his float. As soon as the fish started to run, he pulled up and set the hook perfectly. The fish zig zagged right, came back left but this angler did a really great job of keeping this one out of the rocks. As the fish was coming up just before he pulled it out of the water we could see there was another one of equal size swimming erratically around it. Such beautiful brightly colored fish to see! A fun day! 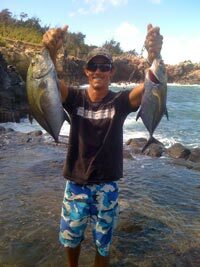 The Bone Fish or Oio in Hawaiian is a highly sought after fish around the world. Fortunately in Hawaii we have some really big ones. 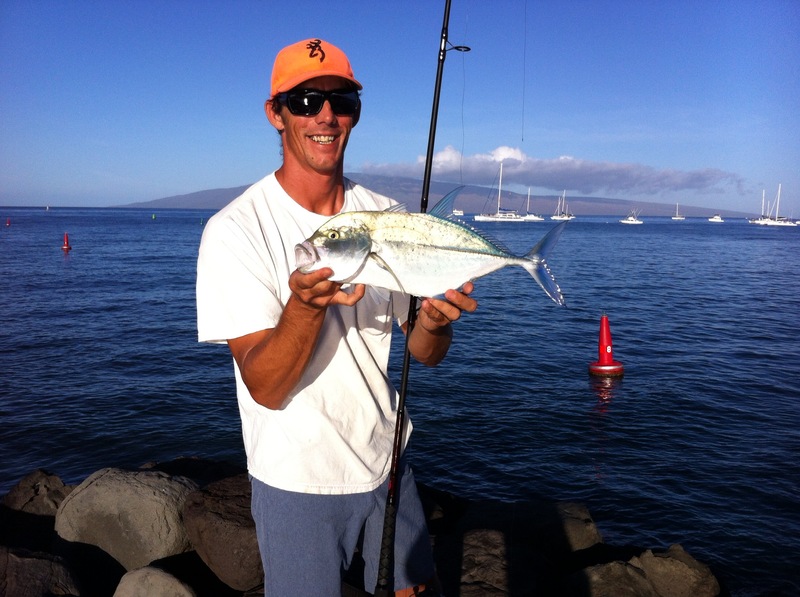 With a lot smaller flats on Maui than Oahu or Kauai we still have great fishing grounds. The bone fish are not the best eating fish but they put up an amazing battle. One you’ll never forget. Ranging in size from 2 – 15lbs, they are very skittish and hard to see. The most effective way to fish for them is by sight. Wading in knee to waist deep water using light tackle, 8 – 15lb. test and casting to the fish using lure or bait. We were fishing from shore off one of the furthest rock points on the north shore of Maui. Trade winds blowing, the beautiful island of Molokai off in the distance and a bucket full of live bait. We were ready for some action. With the first bait on the third cast we hooked the first of three bluefin trevally. Shortly after landing the first one we hooked into the second one. It was like there was a small school swimming around the point where we were fishing. The client wanted to keep some fish to eat for his family. So after we landed the third one, the client suggested we let it go. I thought that was a great idea. It was in line with Hawaiian tradition to take only what you need. I was scouting for a new spot to fish from shore, looking for an easy access beach location. 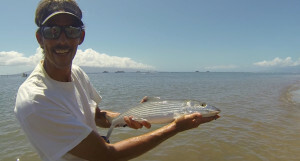 I found a nice shoreline fishing spot just south of Lahaina town. I decided to throw two baits out, put a couple bells on and walk along the beach casting light tackle. I walked down the beach and back to my poles and when I started to approach the rods one of them doubled over. Bell clanging, line screaming off the reel, I dropped my small pole in the sand and ran up and grabbed the rod. I got the bell off and the fight was on! The fish did a hard run straight out taking about 100 yds. of line off my reel. Immediately I knew it was a decent size fish. After it stopped running I started pulling the fish towards shore. The fish was making 50 yard runs from side to side all the way into shore. Once I got it to where the waves were breaking I realized the fish was too big to pull it up with a wave. So I decided to just go out and grab him. What a catch! Just when you think the story is over… As I’m walking up the beach with the fish and the rod in my hand, a guy approached me who saw me fighting the fish from the road and pulled over to check it out. But before I could even say hello to him my other pole doubled over and started screaming line for about 3 seconds and then the line snapped. Oh the one that got away! One for two isn’t bad. I’ll take it any day. We had action from the start, while fishing from the shoreline off this remote point right next to a deep sand channel. We were fishing on the surface and down deep. 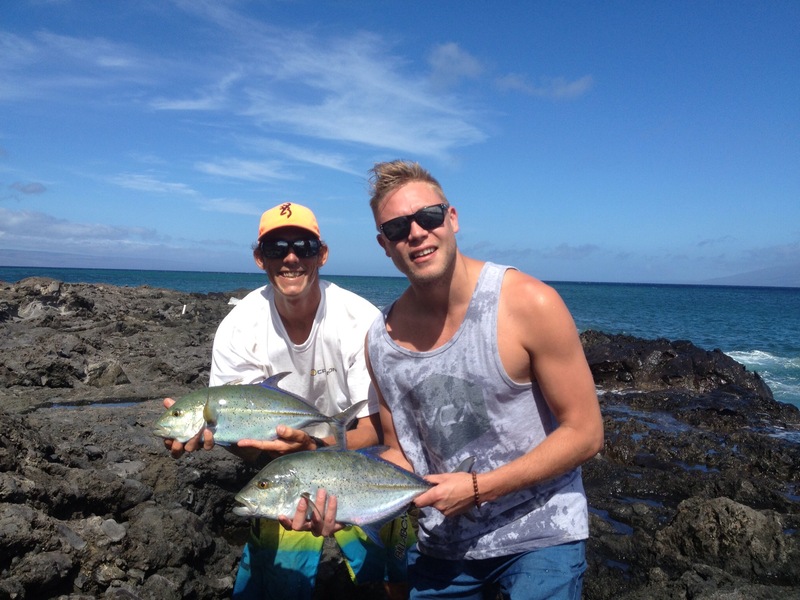 We ended up catching two nice blue fin trevally (omilu) on the surface using bait. Both of the blue fin strikes were pretty similar. While doing a steady retrieve within 15 feet of the rocks you could see the fish chasing the bait with an incredible amount of speed darting back and forth. Finally striking the bait about 10 feet off the rocks and then doing an extremely hard run straight out and fighting back and forth trying to keep him out of the rocks on the way in. Awesome fighting fish! 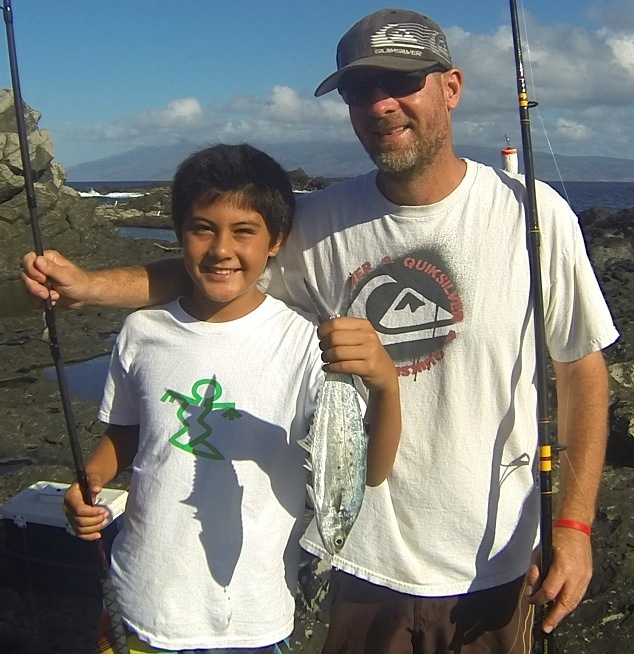 While shore fishing with a father and his 9 year old son, at a secret spot on the northwest side of Maui, we had quite a bit of action right from the start. We lost a couple big fish but they ended up landing a really nice lai (leatherback jack). They are strong fighters and give a good pull. Their skin is a shiny, white, silvery color like a mirror. Some people in Hawaii like to use the skin of the lai to make lures with. Another catch from that trip was a giant needle fish dubbed the poor man’s marlin because they are so acrobatic when on the line. Because of this they usually come off the hook but this boy was able to bring it in! While scouting a new shore fishing location on Maui’s south shore, I had a really good feeling about this point in Makena where there’s a nice surge on the rocks and a great area to land a fish. So I head out on the point with my bucket of live bait. I get a lot of action using live bait. I rig one up on a float. First cast right outside the surge, about 3 seconds after the float hit the water, it disappeared quickly. Line immediately started peeling off the reel with my pole bent over. I knew I had a nice fish on. And it ended up being a prized omilu about 4 lbs. which is the average size. Pretty awesome way to start the day! Sometimes even the easy, convenient places to fish from shore can be pretty productive. 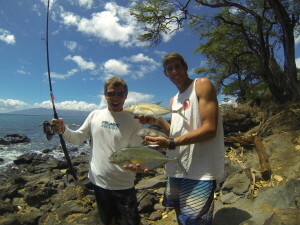 At this spot in Napili, our second fishing location of the day, we were fishing with live ‘oama. We were only casting for 20 minutes when we caught our first fish, the prized omilu. And then another 10 minutes later we got our second omilu. We had a few other bites and a couple other chasers from nice fish that just never bit. 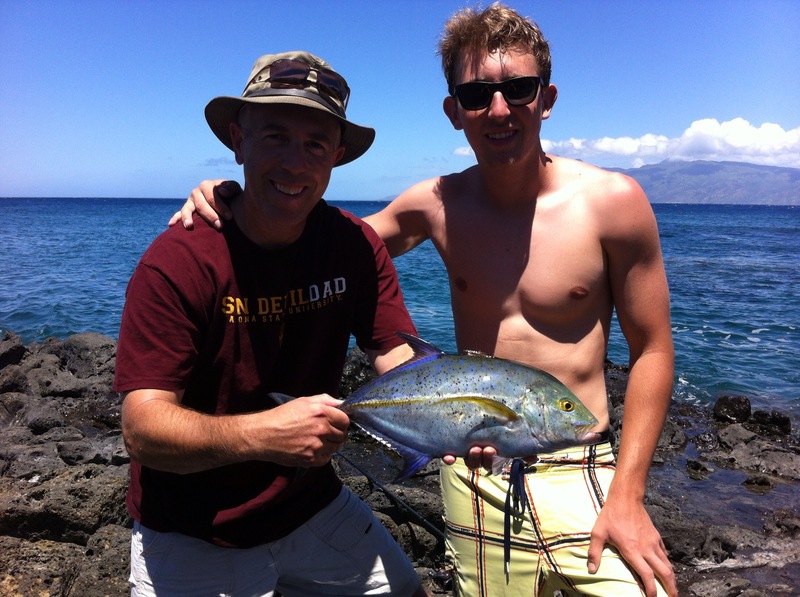 Daniel was stoked to be able to catch good eating fish and take some meat home to feed the family which truly completed the whole experience.